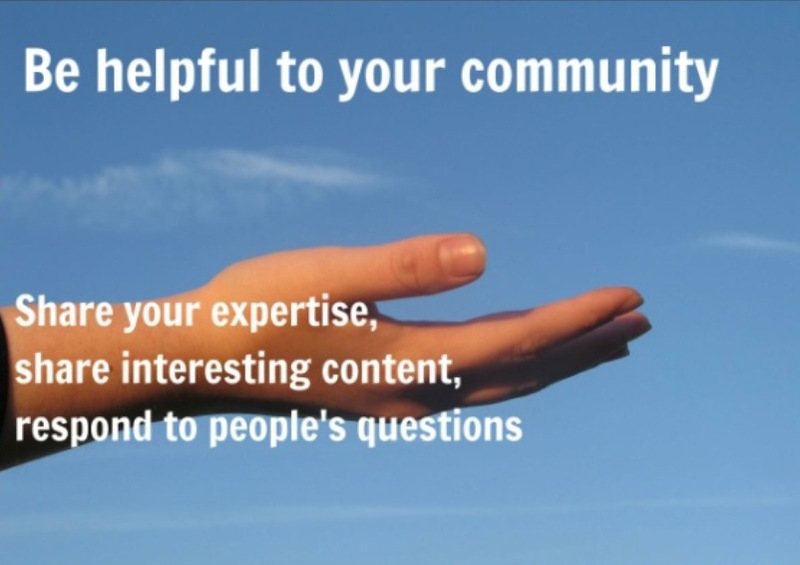 Does your business need a helping hand right now? Do you need someone to assist with your Digital Marketing, project manage a new website / event or just need an interim project sorting? Maybe you’ve got a new product to launch, moving business premises or its a really busy time of year and you need an extra pair of hands. Think of me as your Girl Friday – I can turn my hands to pretty much any project. I love a business challenge. I’m passionate about places, businesses, event management, retail and all things branding, digital & social – even interior design or retail window dressing. Oh and I’m very visual, I always have my Nikon with me – so I do a bit of photography too – Anything that lets me be creative! I live in Burnley and my office is based from home. I’m prepared to travel a bit -but I would need to cover travel expenses. As a Sole Trader -there is just me so you’re supporting an independent business (not a big marketing agency) which means I will go the extra mile for my clients and in most cases give client response 7 days a week and working unsociable hours when required. As a freelance consultant I pay my own taxes, NI & holidays – (which is reflected in my hourly /day rate depending upon the project from £18-25 ph). I can work for you on a temporary or retained basis and invoice you monthly or per job. I can pretty much turn my hand to any business challenge, event or interim project and can help out on a temporary or longer term business as long as it fits in with my existing clients! Maybe we can collaborate on a project? The photo-sharing app announced Monday (8 Feb) that Instagram users will begin to see support for multiple accounts appear in its iOS and Android app this week. You can now add up to 5 Instagram accounts and quickly switch between them without having to log out and log back in. This is included on version 7.15 for iOS and Android, available in the App Store. Note that you can add up to a maximum of 5 accounts. If you need Help as a small business with your social media strategy including the use of Instagram – get in touch. I can offer you training to do your own or manage your Social Media and Digital Marketing for you. Join me along with other guest speakers, Burnley College, Themis and UCLan Burnley for the first ever Professional Development Expo – a unique event that will give you the guidance and tools you need to get ahead in today’s marketplace. I’ll be one of the ‘experts’ (allegedly!!) giving you tips and advice on Growing your online network from 6.00pm-6.25pm. I’ll be giving you tips on using various social media platforms to grow your online networks and outlining the power of Keywords, Hashtags, SEO and good content. Lisa Durkin of Place Shaper, a marketing and place management consultant and former town centre manager, is one of the first in the UK to be qualified to deliver an innovative new digital skills course for the retail sector. Lisa has been trained to deliver the new ‘Digital High Street Skills‘ programme, that aims to conquer the digital divide. Recent research shows that as many as 37% of SMEs still do not have a website! Lisa has a background in town centre management and more recently running her own company Place Shaper where she is an associate lecturer in Digital Marketing at UCFB university in Burnley and an Advisor to over 60 Town teams and Portas Pilots in the North West region delivering training sessions and mentoring support to town teams and partnerships with the Association of Town and City Management. This exciting new programme will help with the up-skilling of the UK’s Small and Medium-Sized Businesses (SMEs) and all those independent retailers and services on our high streets looking to make the move into social media , having an online presence or to enter into e-commerce. Digital High Street Skills is a National Skills Academy for Retail (NSAR) programme, developed and delivered in partnership with the Association of Town and City Management (ATCM) who Lisa also works with as a Town Team Advisor. The programme was recently launched at the Future High Street Summit at the National Space Centre in Leicester. Lisa explained more:“‘Small businesses, independent retailers or market traders in the North West have a huge role to play in ensuring that we have thriving town centres. The objective of the project is to fill the “digital divide” between small and large businesses, and to demonstrate that digital up-skilling will play a crucial role in delivering improved economic results and social experiences on the high streets of the future. ATCM and the National Skills Academy for Retail have worked together, and with town centre and retail experts, to develop the exciting content for the programme. It’s been a year since Mary Portas led a review of England’s struggling high streets.Twelve ‘Portas Pilot’ towns were given a share of just over £1m in a bid to reverse the decline in the first phase followed by a further 15. 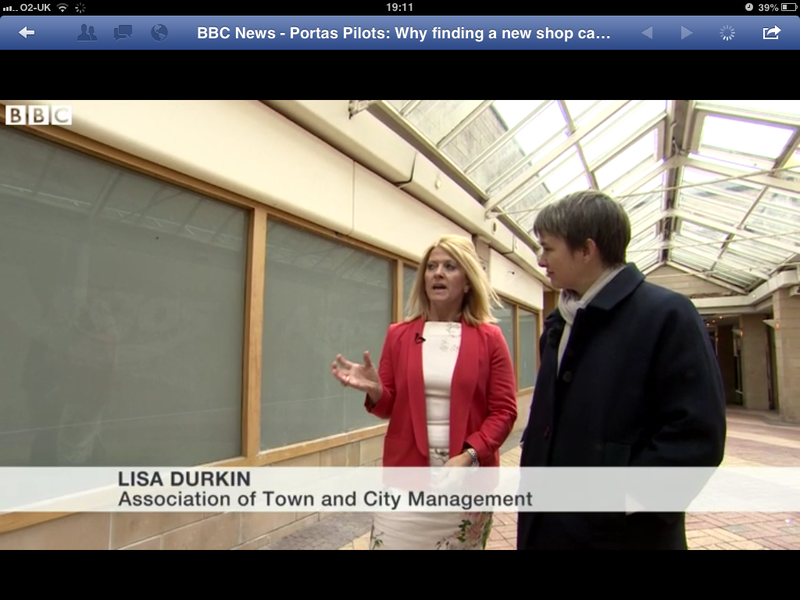 As the Town Team Advisor for the North West, I was contacted by BBC News journalist Emma Simpson to assist with a BBC news feature that would highlight the complex challenges facing our High Streets and the fact it takes a longer than 1 year to make things happen. So on a cold, blustery Friday just before the Spring Bank Holiday in May we set about filming in Nelson Town Centre – a Portas Pilot, interviewing businesses and the Town Team Chair and unravelling some of the complex structural issues facing town centres that are hindering the progress of Town Teams and Portas Pilots- tackling vacant units, high rental values, declining footfall and finding alternative uses for excess retail space. 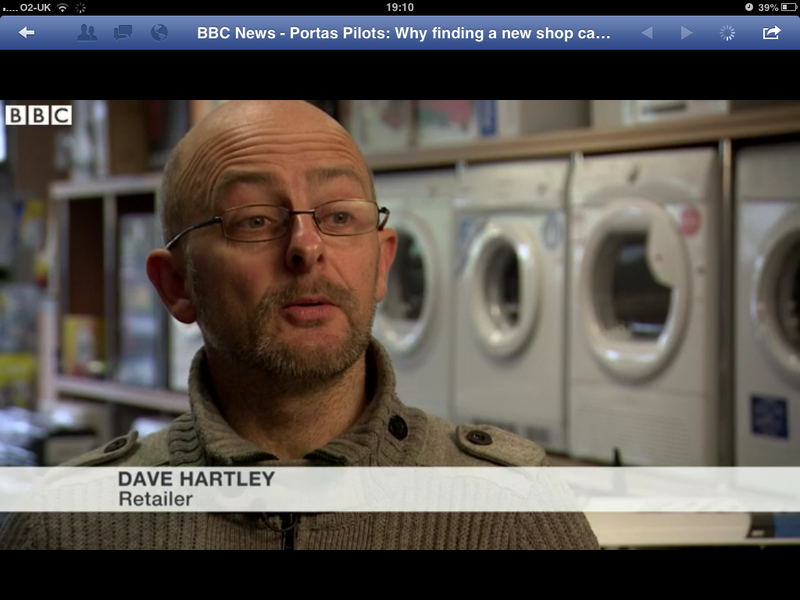 This BBC news piece highlights the reality of the task ahead for our town centres armed with a token sum of £100,000. High streets are an essential part of town centres and always will be but the current town centre business model isn’t working – high streets of the future need to be different; multi channel and multi functional – so lots of place shaping required. We need to explore opportunities to turn surplus empty shops into service, entertainment, social or leisure centres that are fit for purpose for local communities. High Streets need to combine the enthusiasm generated by Mary Portas and the Portas Review with realistic and well managed plans. A lifeline of support and structural change needs to be thrown to declining secondary and tertiary centres in lower income areas like Nelson which means lower business rates, affordable parking, a retail mix that fits the local community and realistic rents by landlords to attract good independent businesses like Dave Hartley. 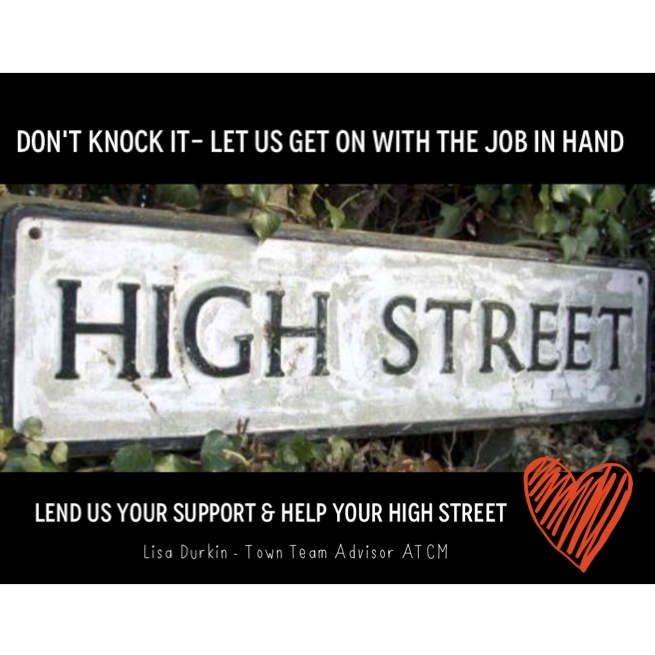 The work has only just begun for me and fellow Town Team Advisors (at the ATCM) and for the 400 + Town teams and Portas Pilots who are tackling these issues head on and making a commitment to their local High Street. Yes at times our communities feel increasingly powerless to shape our town centres but our High Streets need help now and we’re trying. Don’t knock it, let us get on with the task in hand and lend us your support instead. 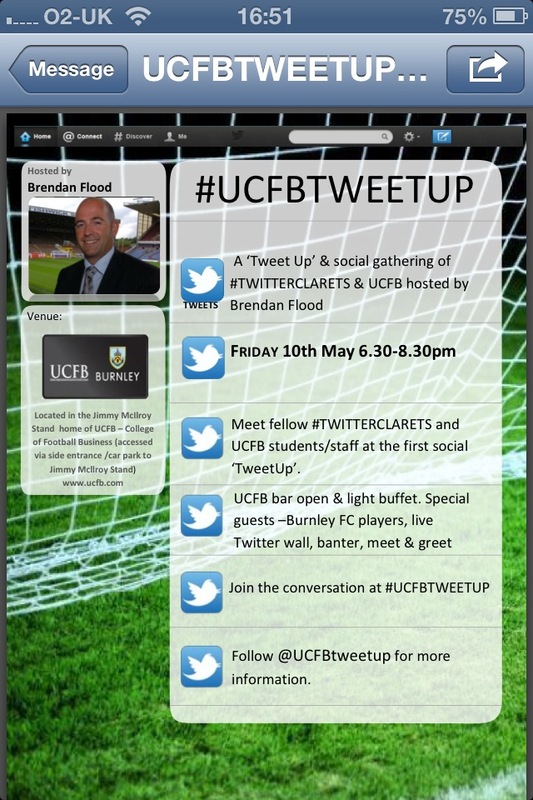 Placeshaper organised a football fans ‘TweetUp’ event for #TwitterClarets and UCFB students at Burnley Football Club on Friday 10 May with Brendan Flood (Former BFC Director and UCFB co founder). Assisted by the team at UCFB and a few of Brendan’s ‘Friends’ including Michael Duff, Brian Jensen, Danny Ings, Paul Fletcher, Colin Waldron, John Deary – it was a great event for engaging with the local community with over 100 people attending. It was also organised & promoted in just 1 week! Read the full storify for the fun and banter! Football Club ‘tweet ups’ are the future! I love social media but I have to admit I’m an Instagram addict and have been for almost 12 months now. If like me you enjoy capturing life with photos you’ll love Instagram. It allows you to shoot and publish online to the social network of your choice in less than 60 seconds and quite creatively too. Modern photo technology now embedded in smart phones allows us to take photos, add special filters and effects and view them instantly. Not only that, you can also tweet, Facebook, Flckr and email that photo to friends and family (or strangers) all around the world in seconds. It’s also a great way of marketing too for brands and businesses. I have set up Instagram accounts for some of my clients who I feel will benefit from it – mainly restaurants and retailers as part of their digital marketing strategy. As a Place Manager you could also use Instagram for a Place too such as a town centre or high street. 3. Make it fun – social networks are social so it gives you an opportunity to put aside corporate formality and experiment with pictures bringing out your personality and creativity – make it exciting. 4. You can have your Instagram photos fed into your interactive website but you’ll need to arrange this with your web developer and set it up. 5. Reveal “behind the scenes” or ‘’funnies’’ – photos that humanise your brand. Or share exclusive content. My favourite celebrity instagrammer is Jamie Oliver the celebrity chef who does this regularly with Instagram. 6. Use Instagram to increase engagement on Facebook by asking open ended questions when posting a photo. This can be as simple as “What do you think about this Instagram Photo of the Day?” On facebook you can add an ‘Instagram’ link on your page as an app. 7. Use #hashtags and Comments on the pictures –by using a # before a key word – this will help users and search engines find you and categorise with your subject or photo. You could also create a hashtag for an event. Only hashtag the most relevant and important words. If you successfully use Instagram for your brand or business I’d love to know what works best for you. Leave your comments below. 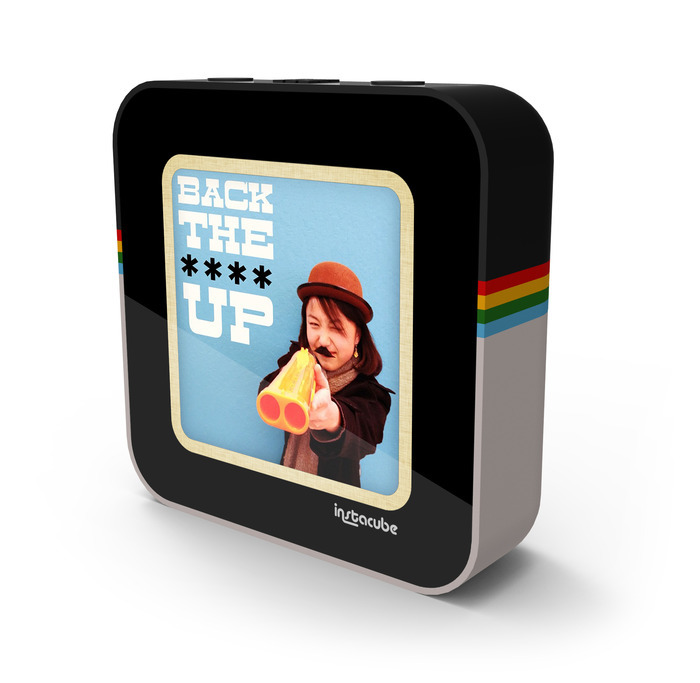 Look out for the Instacube gadget coming soon! I’d love to get my hands on one of these launching soon! What Does ‘MT’ mean on Twitter? It can all get a bit confusing this Twitter mullarkey – you think you’ve sussed it and you pick up on new things! But I’m all for sharing new tips so we can all enjoy a very powerful social media tool in a respectful way. ‘MT’ is a signifier of the fact that the poster has added a little something of their own value to the tweet in republishing it by modifying it. There are many reasons why you may tweak a tweet to either boost its value or add a view whilst still respectfully attributing it to the original ‘poster’. Indicating that you have added (or perhaps deleted) an element of the tweet, usually indicated by placing the altered element in [square brackets] to offer another angle, challenge an assertion, or confer approval. Correcting a typo or factual error (be sure it is actually an error; again, flag up the change you’ve made). Regarding the question of respectful attribution: you may ask ‘isn’t it rude to modify someone’s tweet?’ Ultimately, this is a matter of personal opinion. Personally I’m delighted to see someone MT a tweet that I have posted on the basis that it indicates to me that the original publication triggered a chain of thought, a pattern of association, or a new conversation. For me, the MT encapsulates the benefits and virtues of social business and polite etiquette in two letters. If you’re a small business or place and you need help with your social media strategy get in touch via my contact page. Mary Portas Visit Nelson 29 Jan 2013, a set on Flickr.